SK Boxes are specifically designed to securely package tapered shank tool holders. 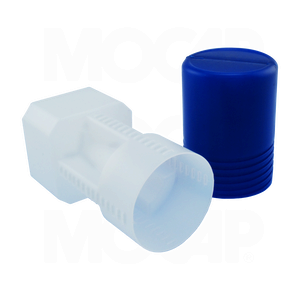 Molded in durable High Density Polyethylene (HDPE), SK Boxes are custom designed to fit BT & DIN ISO 40 and ISO 50 spindle-nose tapered tool holders. SK Boxes feature secure closure, variable length threaded adjustable cap, stackable square base, optional plastic labels and are re-useable. SK Boxes are available in transparent natural colored High Density Polyethylene (HDPE). Additional colors available.